Our writers pride themselves on their ability to provide clients with career documents that effectively showcase their unique professional goals, background, and needs. We understand that getting a draft back to you IMMEDIATELY can be an absolute necessity. For an additional cost we can provide you with a first draft of any of your documents within two business days. Place your rush order now! Note: A first draft of your document will be made available to you within two business days once you have completed our questionnaire and uploaded all relevant documents. You will have the opportunity to work with your writer on unlimited revisions for up to three months. 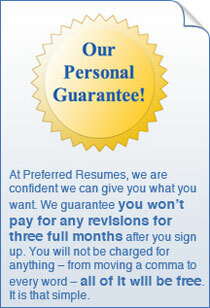 Turnaround time for each subsequent revision is two to five business days. I want to opt for normal services. "I think the cover letter is very good. I also like the changes you made to the resume. Thanks."